August 30, 2011  Amnesty International and Human Rights Watch say Sudanese planes have been terrorizing civilians in the Nuba mountains region of Southern Kordofan. Researchers from the two human rights groups managed to sneak into the region recently to document what they say have been ongoing and indiscriminate air strikes in the region. Sudan claims that the newly independent country of South Sudan is fomenting unrest in Kordofan. Human rights groups say there is an armed conflict in the region, but that doesn't excuse attacks on civilians. August 25, 2011  Supporters of the Mujahedeen-e Khalq see it as a potentially useful group in countering Iran. 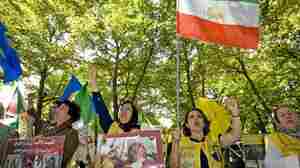 Others see it as a dangerous cult, saying support for the MEK could undercut peaceful democracy activists in Iran. August 24, 2011  The Obama administration is promising to free up more than $1billion in Libyan assets to help the Transitional National Council meet the urgent needs of Libyans in Tripoli and elsewhere. International Diplomats are also ramping up their post-Gadhafi planning. They will hold meetings this week Istanbul, Turkey, and in New York. 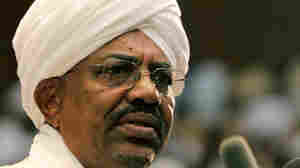 A New Obstacle To Normal Relations For Sudan, U.S.
August 23, 2011  Sudan says it has met the demands of the international community and wants U.S. sanctions lifted. But the two countries are at odds over recent fighting in the southern part of Sudan. August 22, 2011  A top U.N. Human Rights official says the death toll in Syria has climbed to over 2,200 people, 350 of whom have been killed since the beginning of the Muslim holy month of Ramadan. High Commissioner Navi Pillay repeated her call for Syria to end a crackdown on dissents — and told the Human Rights Council in Geneva that Syria's actions could amount to crimes against humanity. Arab states joined other members of the Human Rights Council at a special session in Geneva Monday, calling for a formal inquiry. The Obama administration calls this another sign of how isolated the Syrian regime has become. August 22, 2011  President Obama says it is time for Libyan leader Moammar Gadhafi's regime to officially end. The U.S. has played a key role in supporting the NATO campaign that began in March — aimed at protecting civilians and the rebels. August 18, 2011  The U.S. calls on Syria's president to step down and announces new sanctions on the Damascus government. Washington's move was followed by similar action from the European Union. August 18, 2011  President Obama released a written statement Thursday morning calling for the resignation of Syrian President Bashar Assad, condemning "the disgraceful attacks on Syrian civilians," and issuing an executive order imposing new sanctions on the Syrian government. August 16, 2011  Secretary of State Hillary Clinton says that U.S. diplomatic efforts require more resources for important programs in several parts of the world, particularly in Arab states undergoing rapid change. 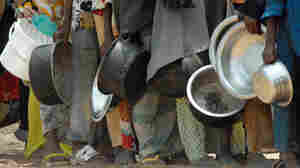 August 13, 2011  As the U.S. and other donors scramble to help Somalis survive a famine, some experts see an opportunity of sorts. The drought, they say, seems to be starving the Islamist militia al-Shabaab of resources, limiting its ability to wreak havoc in Somalia. August 10, 2011  Aid groups say they are making progress in delivering food to Somalia. But the need is critical and growing as the death toll continues to mount. July 30, 2011  Part of Somalia affected by famine is controlled by al-Shabaab, a group on the U.S. terrorism blacklist, which places restrictions on U.S. humanitarian groups hoping to reach people in that area. 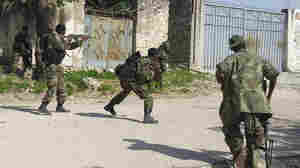 The State Department is negotiating with groups to ease the rules due to the severity of the crisis. July 28, 2011  Negotiating Palestinian statehood was an early priority for President Obama's administration. But these days, U.S. diplomats are spending much of their time trying to stop the Palestinians from seeking U.N. recognition. With talks at a standstill, Palestinians say they have no other choice. 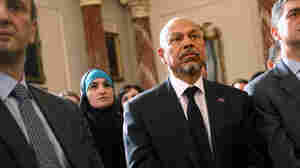 July 27, 2011  Ali Aujali was the Libyan ambassador to the U.S. under Gadhafi, but resigned after the uprising began. As a representative of the rebel council now, he's trying to get access to the country's frozen assets — and also to his office at the embassy in Washington, D.C.
July 22, 2011  The international community is struggling to respond to the famine in Somalia. U.S. officials say the terrorist group known as al-Shabaab has been preventing hungry Somalis from getting access to assistance. Some aid groups say U.S. policy in the region is also preventing them from doing life-saving work.